This post is part of our ongoing series on running Cassandra on Kubernetes. We’ve published a number of articles about running MySQL on Kubernetes for specific platforms and for specific use cases. If you are looking for a specific Kubernetes platform, check out these related articles. Red Hat OpenShift is a comprehensive enterprise-grade application platform built for containers powered by Kubernetes. OpenShift lets developers quickly build, develop, and deploy applications on nearly any infrastructure, public or private. OpenShift comes in four flavors – OpenShift Origin, OpenShift Online, OpenShift Container Platform, and OpenShift Dedicated. OpenShift Origin is the upstream, open source version which can be installed on Fedora, CentOS or Red Hat Enterprise Linux. OpenShift Online is the hosted version of the platform managed by Red Hat. OpenShift Container Platform is the enterprise offering that can be deployed in the public cloud or within an enterprise data center. OpenShift Dedicated is a single-tenant, highly-available cluster running in the public cloud. For this walk-through, we are using a cluster running OpenShift Origin. Portworx, is a cloud native storage platform to run persistent workloads deployed on a variety of orchestration engines including Kubernetes. With Portworx, customers can manage the database of their choice on any infrastructure using any container scheduler. It provides a single data management layer for all stateful services, no matter where they run. Portworx is Red Hat certified for Red Hat OpenShift Container Platform and PX-Enterprise is available in the Red Hat Container Catalog. This certification enables enterprises to confidently run high-performance stateful applications like databases, big and fast data workloads, and machine learning applications on the Red Hat OpenShift Container Platform. Learn more about Portworx & OpenShift in our Product Brief. This tutorial is a walk-through of the steps involved in deploying and managing a highly available Cassandra database on OpenShift. OpenShift Origin can be deployed in a variety of environments ranging from VirtualBox to a public cloud IaaS such as Amazon, Google, Azure. Refer to the official installation guide for the steps involved in setting up your own cluster. For this guide, we run an OpenShift Origin cluster in Microsoft Azure. Follow the instructions mentioned in Azure documentation. Your OpenShift cluster setup should look similar to the below configuration. It is recommended that you run at least 3 nodes for the HA configuration. Though almost all the steps can be performed through the OpenShift Console, we are using the oc CLI. Please note that most of the kubectl commands are available through oc tool. You may find the tools used interchangeably. Since OpenShift is based on Kubernetes, the steps involved in installing Portworx are not very different from the standard Kubernetes installation. Portworx documentation has a detailed guide with the prerequisites and all the steps to install on OpenShift. Before proceeding further, ensure that Portworx is up and running on OpenShift. 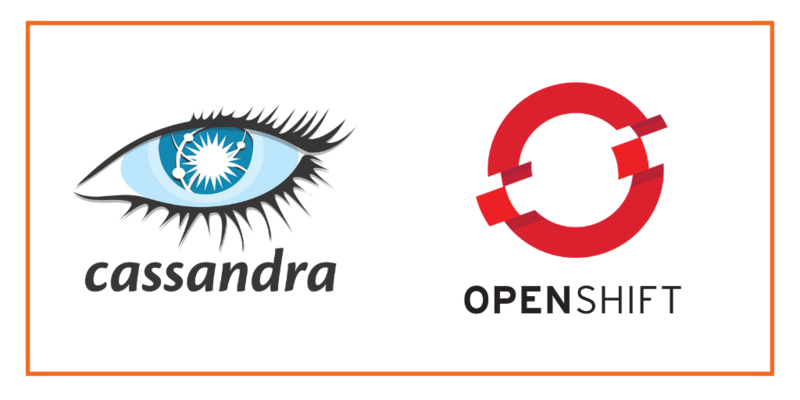 Once the OpenShift cluster is up and running, and Portworx is installed and configured, we will deploy a highly available Cassandra database. In this example, the storage class that we deploy has a replication factor of 3 with I/O profile set to “db,” and priority set to “high.” This means that the storage will be optimized for low latency database workloads like Cassandra and automatically placed on the highest performance storage available in the cluster. Finally, let’s create a Cassandra cluster as a Kubernetes statefulset object. Like a Kubernetes deployment, a statefulset manages pods that are based on an identical container spec. Unlike a deployment, a statefulset maintains a sticky identity for each of their Pods. For more details on statefulsets, refer to Kubernetes documentation. A statefulset in Kubernetes requires a headless service to provide network identity to the pods it creates. The following command and the spec will help you create a headless service for your Cassandra installation. Now, let’s go ahead and create a statefulset running Cassandra cluster based on the below spec. Verify that all the pods are in the Running state before proceeding further. Let’s also check if persistent volume claims are bound to the volumes. Notice the naming convention followed by OpenShift for the pods and volume claims. The arbitrary number attached to each object indicates the association of pods and volumes. 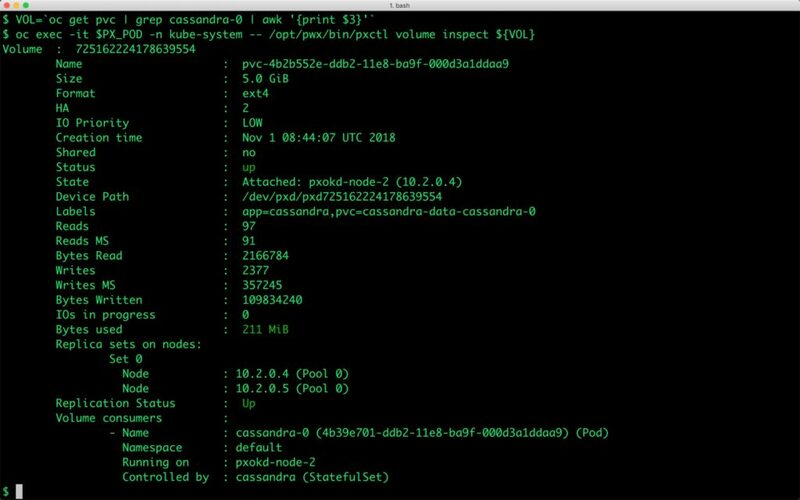 We can now inspect the Portworx volume associated with one of the Cassandra pod by accessing the pxctl tool. The output from the above command confirms the creation of volumes that are backing Cassandra nodes. We can also use Cassandra’s nodetool to check the status of the cluster. Let’s populate the database with some sample data by accessing the first node of the Cassandra cluster. We will do this by invoking Cassandra shell, cqlsh in one of the pods. Now that we are inside the shell, we can create a keyspace and populate it. Let’s verify that the data is populated. You can run the select query by accessing cqlsh from any of the pods of the statefulset. Run nodetool again to check the replication of the data. The below command shows that the hosts on which the row with officecode=6 is available. Let’s get the node name where the first pod of Cassandra statefulset is running. Now, let’s simulate the node failure by cordoning off the Kubernetes node. Let’s go ahead and delete the pod cassandra-0 running on the node that is cordoned off. Kubernetes controller now tries to create the pod on a different node. Wait for the pod to be in Running state on the node. Let’s access the data in the first pod of the statefulset – cassandra-0. Observe that the data is still there and all the content is intact! We can also run the nodetool again to see that the new node is indeed a part of the statefulset. Portworx enables storage admins to perform backup and restore operations through the snapshots. 3DSnap is a feature to capture application consistent snapshots from multiple nodes of a database cluster. This is highly recommended when running a multi-node Cassandra cluster as a Kubernetes statefulset. 3DSnap will create the snapshot from each of the node in the cluster, which ensures that the state is accurately captured from the distributed cluster. 3DSnap allows administrators to execute commands just before taking the snapshot and right after completing the task of taking a snapshot. These triggers will ensure that the data is fully committed to the disk before the snapshot. Similarly, it is possible to run a workload-specific command to refresh or force a sync immediately after restoring the snapshot. This section will walk you through the steps involved in creating and restoring a 3DSnap for the Cassandra statefulset. It’s a good idea to flush the data to the disk before initiating the snapshot creation. This is defined through a rule, which is a Custom Resource Definition created by Stork. Create the rule from the above YAML file. We will now initiate a 3DSnap task to backup all the PVCs associated with the Cassandra pods belonging to the statefulset. Let’s now verify that the snapshot creation is successful. Let’s now restore from the 3DSnap. Before that, we will simulate the database crash by deleting the statefulset and associated PVCs. Now our Kubernetes cluster has no database running. Let’s go ahead and restore the data from the snapshot before relaunching Cassandra statefulset. We will now create three Persistent Volume Claims (PVCs) from existing 3DSnap with exactly the same volume name that the statefulset expects. When the pods are created as a part of the statefulset, they point to the existing PVCs which are already populated with the data restored from the snapshots. Let’s create three PVCs from the 3DSnap snapshots. Notice how the annotation points to the snapshot in each PVC manifest. Create the PVCs from the above definitions. Verify that the new PVCs are ready and bound. With the PVCs in place, we are ready to launch the statefulset with no changes to the YAML file. Everything remains exactly the same while the data is already restored from the snapshots. Check the data through the cqlsh from one the Cassandra pods. Congratulations! You have successfully restored an application consistent snapshot for Cassandra. Portworx can easily be deployed on Red Hat OpenShift to run stateful workloads like Cassandra in production. It integrates well with K8s statefulsets by providing dynamic provisioning. Additional operations such as expanding the volumes and performing backups stored as snapshots on object storage can be performed while managing production workloads.